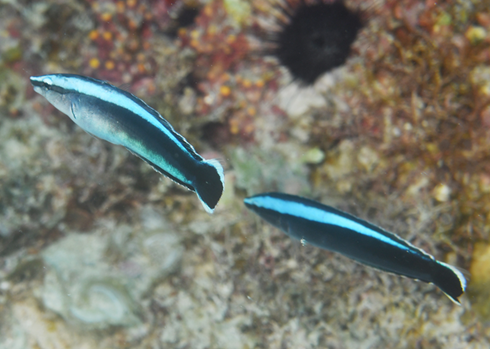 Cleaner wrasses are of interest to me on a few counts; but especially academic and photo-making. They’ve been favorites of study for me before literally and actually diving into their study off the coast of California as a teenager. One of the three species of Labrids here is the Senorita (Oxyjulis californica); a facultative (non-obligate) cleaner of many important game fishes. Its presence and population have been positively correlated with abundance and health of host fishes; as have the members of the genus in our topic here. Is the positive correlation a matter of advantage for one or the other species, both, or simply chance? Conditions favoring the wrasse and its hosts? As a content provider for the dive-adventure travel as well as ornamental aquatics genres I’m always looking for “good shots” to sell, mostly “verticals”, portrait format that might sell as covers or for advertisement use. There are no more productive places to find such scenes as at cleaning stations. All one needs is to identify these aquatic barber shops and keep circling about; eventually, most all fish and more come in for a cleaning, including gigantic Manta Rays. There are several erstwhile cleaner organisms, including shrimp and several fish species. 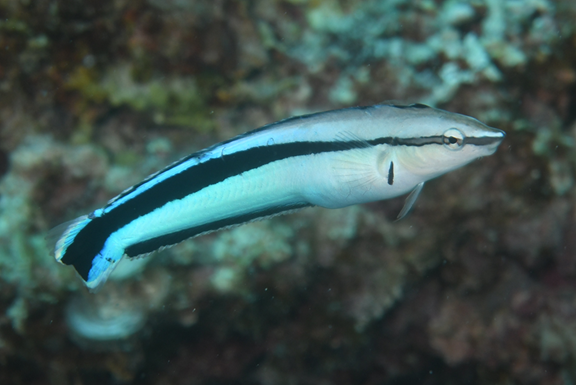 Amongst the five species of cleaner wrasses that make up the genus Labroides, the most commonly occurring in the wild and ornamental aquatics interest is the Bluestreak. Unfortunately, it is also historically the poorest survivor amongst them; but not to despair; there are records of folks successfully husbanding them for months to years. In this brief piece I will share with you the practical biology and impressions concerning what works to keep Labroides wrasses, in particular, L. dimidiatus in captivity. Labroides is abundant throughout its wide range, in the Indo-South Central Pacific; from French Polynesia to East Africa and the Red Sea. This fish grows to a maximum of about four inches/ten centimeters in standard length. A fang blenny mimic and juvenile "real thing" in Mauritius. Labroides dimidiatus is reef associated. This species is always found in relatively shallow (20-40 foot depths) near substantial reef structure; rock and coral. There, usually as pairs, though may be solitary or in small groupings with younger individuals, they “operate” established cleaning stations. All manner of fishes, singly, in schools… small to VERY large (like Manta rays) happen by for removal of necrotic tissue, and possibly parasites. 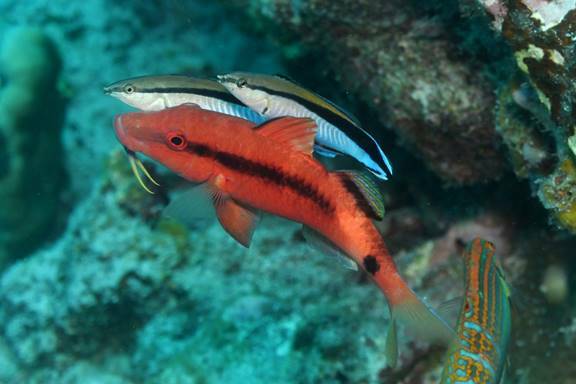 A pair/couple of Labroides dimidiatus and a color-displaying Goatfish “customer” being worked on at a cleaning station in Mauritius. Notice the Halichoeres wrasse bottom right getting in line. You want to arrange a similar prominent bommie… uprising of solid material for your Labroides to center itself; with some openings, overhangs for it to feel like it can duck out of sight. Current should be medium to brisk; water quality must be per keeping a proper reef system of size. Due to the need for stable conditions and stocked potential host fishes, Cleaner wrasse systems should be large; at least a hundred plus gallons. I want to re-emphasize the dismal historical survival of this one species of Labroides and make a plain statement concerning conservation of congeners. NONE are easy to keep; and though L. dimidiatus is quite abundant throughout its wide range; it should not be purchased casually. 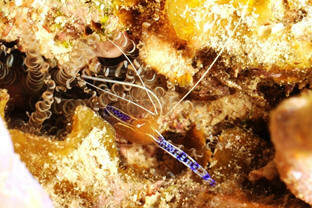 There ARE far hardier cleaner species; many shrimps and gobies of the genera Gobiosoma and Elacatinus especially; that are suitable for most reef and semi-reef systems. I have campaigned to restrict the Hawaiian endemic, L. phthirophagus for commercial use, wondering if its limited presence on Hawaiian reefs was important in maintaining fish health there. The “verdict is still out” here, scientific studies asserting and denying this role; however, all the “other” species of Labroides I’d leave on the world’s reefs rather than removed for ornamental use. IF you are going to try one, I implore you to do your best to keep it alive, healthy. Okay, off my soap-box. Wait! STOP PRESSES: This just in: Quality Marine (Los Angeles) has on offer, CAPTIVE-REARED Hawaiian Cleaners!!! 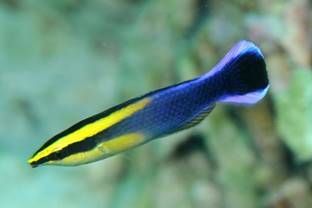 http://www.reef2rainforest.com/2016/12/20/quality-marine-receives-the-first-captive-bred-hawaiian-cleaner-wrasses-labroides-phthirophagus/. These fish come conditioned to frozen/defrosted foods typically used by hobbyists; and are that much hardier, aquarium suitable. Labroides dimidiatus itself is “soft bodied” and due to low price to collector-divers and shipping agencies in turn, they are not handled gently, too often over-crowded, and as usual, not fed through the chain of custody for a week, perhaps two till arriving at your r/e-tailer. Due to mostly this lack of care, a good deal of Bluestreaks are lost prematurely; I’d hazard a guess that more than half don’t make it from the ocean to your dealer; dying enroute. The ones that do survive up to this point are worse for wear as you might imagine; starved, likely net-beat, and STRESSED. As with shopping for small blennies, gobies, basslets… you need to balance how long the specimen/s you’re considering with awareness that you neither want them to be “too new” or “too old” as in how long they’ve been on hand. Too new is a day or two from arrival at your dealers. Most newly arrived marine organisms that are going to die do so within the first 24 hours of arrival. On the other hand, specimens that have been on hand, and likely not feeding for a week or more are also highly likely to perish. You want to choose amongst those who’ve been about between these times generally; unless you’re incredibly fortunate to be offered ANY specimen that is actually feeding. The usual “acid test” of whether an animal is feeding or not applies orders of magnitude more with this Wrasse; so ask that the dealer proffers various foods and see which, if any are interested. Buyer beware! The Sabertooth Blenny here (Aspidontus taeniatus) is a very close mimic of the common Blue Cleaner Wrasse; even jump-swimming about in a similar fashion to fool would be host fishes looking for a cleaning; only to get a nasty nip. Note the subterminal underslung mouth of the Blenny versus the terminal one of the real-thing Wrasse. Most wholesalers will detect and toss these imposters, but I have seen them in retail settings, waiting for their chance to nip your valuable marine fishes! Cleaner wrasses should only be introduced to fully established systems that lack overly aggressive tankmates, though triggers, big puffers, morays and more will generally recognize cleaner organisms for what they are and eschew inhaling them. You want to have a large enough system, with a good deal of other fishes to provide a “customer base” for your cleaner. 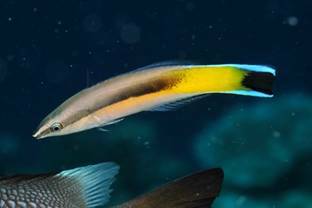 Opinions, observations vary, but genus Labroides wrasses are generally considered obligate rather than facultative cleaners; that is, they “have to” clean to gather sufficient nutrition. Again, in captivity I have witnessed personally, and read several accounts of people who’ve had L. dimidiatus learn to accept other foods; sufficient to not clean at all. To initially get your specimen/s feeding, I suggest offering a wide mix of live and frozen/defrosted foods as appropriately small pelleted foods. Recent years have proven the palatability of the last; with many fishes taking pellets with gusto. Ongoing, it’s important to sustain your wrasse with frequent small feedings during lights-on hours. Pellets are easily offered regularly through automated feeders; live food organisms via large refugiums and otherwise hand feedings three times or more per day. The other four species of Labroides are decidedly splashier in color and overall trend to be captive suitable; surviving capture, handling and shipping better and adapting to prepared foods more readily. This being stated, none of the Labroides are easy to secure good specimens, or acclimate to captivity; most dying within a month of purchase; with only a few percent living more than three months. 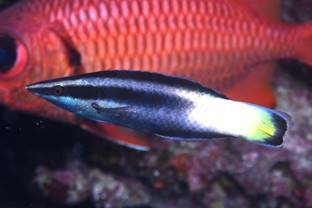 Labroides bicolor Fowler & Bean 1928, the Bicolor Cleaner Wrasse, easily recognized, easily lost Indo Pacific beauty. Indo-Pacific, east Africa to Micronesia. To five and a half inches in length. Labroides pectoralis Randall & Springer 1975, the Blackspot Cleaner Wrasse. Indo-Pacific, Christmas Island to the Line Islands. To four and a half inches in length. 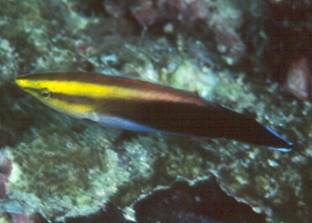 Labroides phthirophagus Randall 1958, the endemic Hawaiian Cleaner Wrasse . To nearly five inches in length. Labroides rubrolabiatus Randall 1958, the Red Lip Cleaner Wrasse, of the Pacific's. To four inches in length. The Neon or Cleaner Gobies, Genera Gobiosoma (29 species) and Elacatinus (7 species): Cultured specimens are even better than wild-collected. 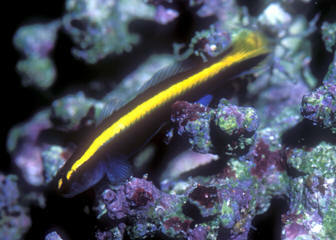 Shown here: Gobiosoma oceanops (Jordan 1904), THE Neon Goby. Tropical West Atlantic; southern Florida to Belize. To two inches in length. Here in an aquarium cleaning a (Pacific) Fancy Bass. Most fishes, though they may be from other seas, recognize cleaners for what they are and eschew eating them. 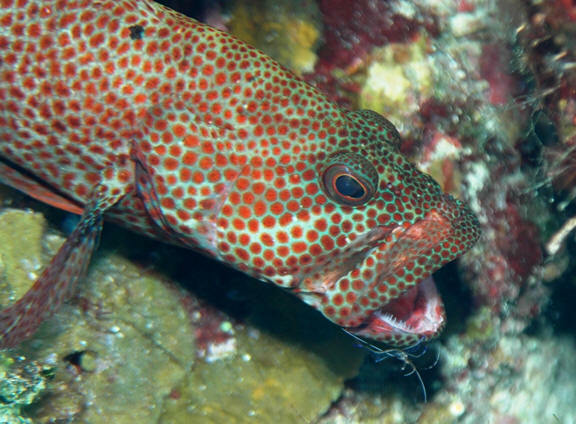 Cleaner gobies have much to recommend them for most all tropical reef aquarium systems. They're pretty, interesting behaviorally, readily available and inexpensive, and they perform a useful function in the wild and your tanks in removing necrotic tissue and possibly parasites, making for a much less stressful setting for all. Gobiosoma randalli Bohlke & Robins 1968. Yellownose or Randall's Goby. Tropical West Atlantic; Puerto Rico to Venezuela. To under two inches in length. Here are an individual in captivity. 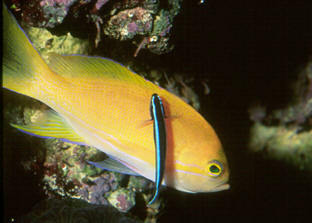 Other cleaner fish families include several of the wrasses, small Angels and pipefishes. 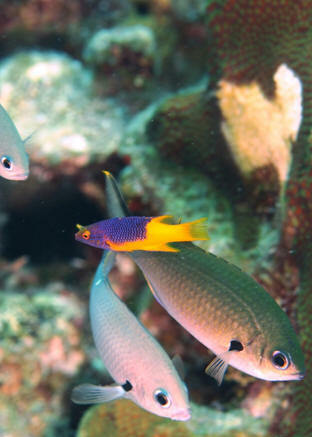 The Labrids range from young Hogfish species, a few of the “tube lip” genera… And a fish I studied in College, the Senorita, Oxyjulis californica. Here a Bodianus rufus (Linnaeus 1758), the Spanish Hogfish is working a group of posturing, color-changing Damsels at its cleaning station in Bonaire. Western Atlantic; Bermuda to Brazil. To sixteen inches maximum length. In the wild eats mollusks, urchins, Brittlestars, crustaceans, and juveniles act as facultative cleaners. Hardy aquarium species. Stenopodidae: Boxing Shrimps… can become more eat ‘em uppers than cleaners; when larger and hungry. 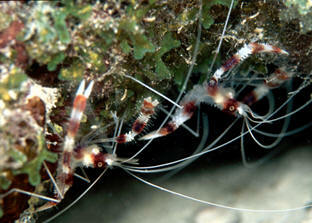 The most common by far is Stenopus hispidus Olivier 1811, the Coral Banded Boxing Shrimp. Worldwide tropical distribution. Males smaller, more slender than females. Keep in reef settings with a cave of their own. May consume small fishes, other crustaceans. Eat most all meaty foods. Here is a pair waiting for customers at their station in Bonaire. 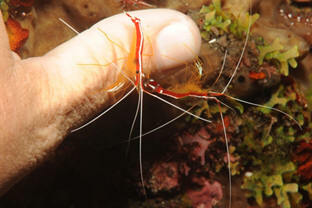 Hippolytidae: Anemone Shrimps (and Broken Back): Including the popular Lysmata amboinensis (De Man 1888), the Indo-Pacific White-Striped Cleaner Shrimp or Ambon Shrimp. Widespread in the tropical Indo-Pacific and Red Sea. Telson white, uropods with two white dots. Can be kept singly or in groups. A hardy Cleaner. Need hiding places to avoid predators during molting periods. Conditions: temp. 20-27 C. Here a pair are giving me a manicure in Bali. 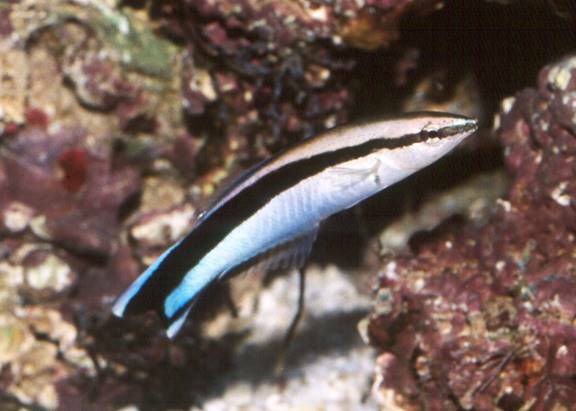 The Bluestreak Cleaner Wrasse is still not an easy species for aquarists, professional or advanced to keep in captivity; the vast majority perishing in transit from collection through distribution, likely more than ninety five percent dying within a month of being installed in their main/display systems. However, there are proven means of improving ones chances. These are identification and selection of initially healthy specimens; acclimation to suitable settings; and provision, training on to prepared foods. Burgess, Warren E. 1981. The Genus Labroides. Tropical Fish Hobbyist 2/81. Fenner, Bob. 1990. Cleaning Symbiosis Amongst Fishes. Freshwater and Marine Aquarium 7, 8/90. Fenner, Robert. 1995. The conscientious marine aquarist, with notes on Cleaner Wrasses. TFH 5/95. Nelson, Joseph S. 1976. Fishes of the World. Wiley & Sons, N.Y.
Parker, Nancy J. 1973. Cleaner Wrasses. Marine Aquarist 4(3)/73.